Delirium Dive has a reputation as one of North America’s most formidable and hair-raising ski runs. Whilst the upper sections of ‘the Dive’ do indeed offer up some of the steepest and most daunting lines you’ll find in any ski resort, most of the terrain that makes up this area can be successfully navigated by any advanced skier or snowboarder with a sense of adventure. The rewards for those who do take the plunge are ample, with stunning views, powder stashes galore, and acres of incredibly varied terrain to explore. 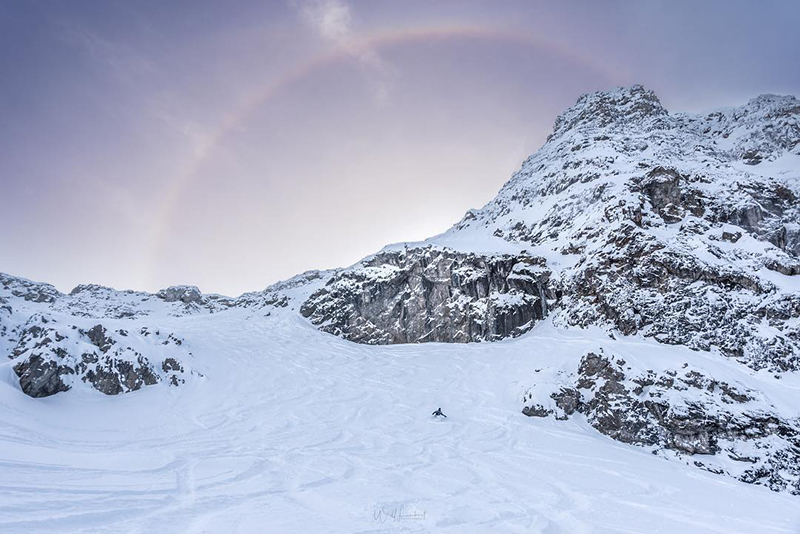 There’s one important aspect that sets this alpine playground apart from almost all other ski areas, however: it is mandatory for users to be fully equipped with avalanche gear and a partner before they can even access this freeride zone. Sunshine Village’s Snow Safety team do use their expertise (as well as lots of explosives) to mitigate the avalanche hazards which are inherent to this kind of steep terrain. But this backcountry-style environment is big and complex, and all riders need to be personally aware of the risks. 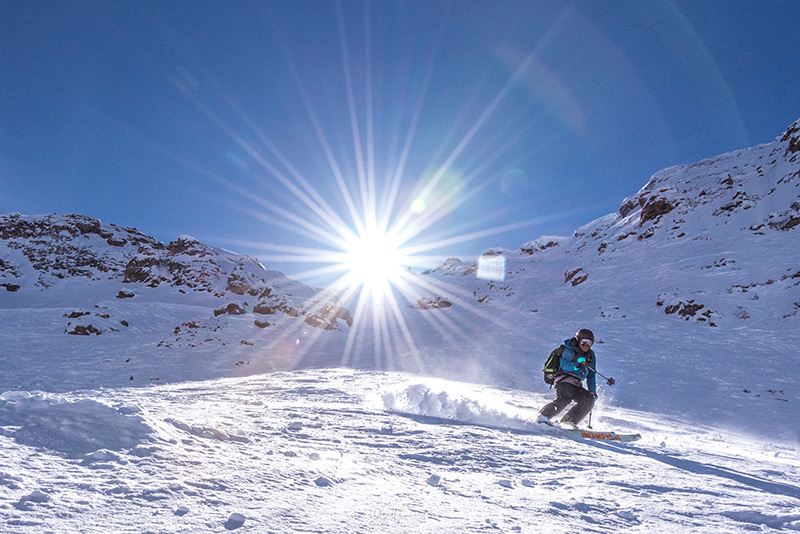 Sunshine’s sensible approach to this reality is commendable, with their restrictions fostering a sense of shared responsibility, as well as actively encouraging users to become educated about safe travel in avalanche terrain. 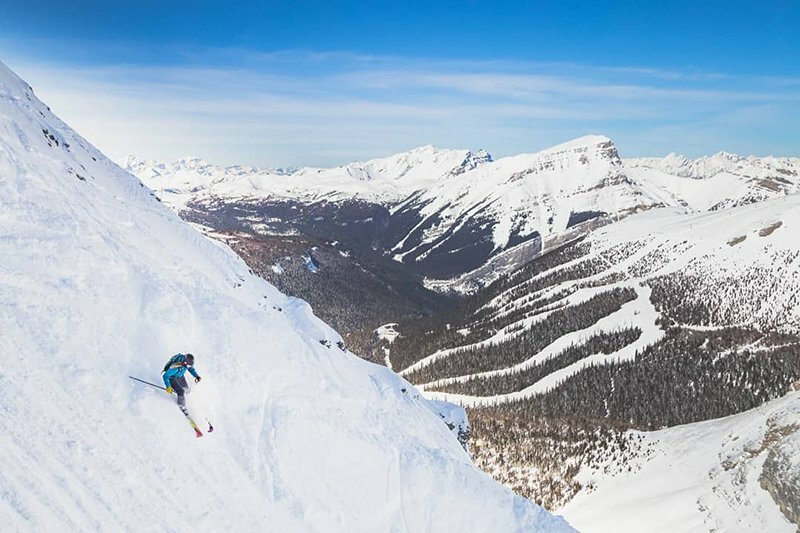 Although the Dive can seem intimidating from the top, its easiest routes down are similar to many of the other double black diamond runs available at Sunshine Village and other big resorts. Hike to the upper reaches of the Wildside or Farside chutes on Goat’s Eye at Sunshine to test your skills. If you’re comfortable on these, you might just be ready to take on the Dive. You can also hike to the Dive’s entrance at the top of Lookout Mountain via the viewpoint access (as long as you leave your skis behind). This way you can look into Delirium for yourself. The incredible 360-degree summit views are well worth the boot pack even if you decide you aren’t quite ready to dive in yet. 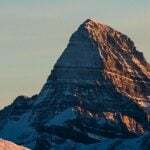 If you think you are ready you’ll need to make sure you have a willing partner as well as the three essential pieces of avalanche rescue gear: a digital avalanche transceiver, a metal shovel and a collapsible probe. (Insider Tip: Snowtips-Bactrax in Banff have full avalanche packs for rent at very reasonable rates.) Just having these in your possession won’t cut it though – you need to know how to use them. 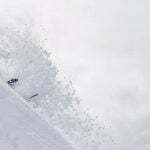 Taking an Avalanche Skills Training Course with a certified avalanche professional is the best starting point. In addition to this, practicing how to use this gear with your buddies is a must. Head to one of the practice areas at the local resorts or just set up a practice area with your friends and place bets on who can find and dig out some buried backpacks the fastest. The final step is checking the status. Whether Delirium Dive opens or not on any given day is heavily dependent on snow conditions and the weather. Call the Delirium Dive hotline, check Sunshine Village Snow Safety‘s twitter @ssvsnowsafety, or stop by the Delirium Dive gate to find out the latest. The gate to Delirium Dive is found at the top of the Continental Divide chair. Here you’ll also find a map of the area and an information board which will provide some insight on current conditions – check both so you know what to expect. Make sure your transceiver is on and secured under your outer layers, and that your probe and shovel are stashed away safely in your backpack. You must then enter through the designated gate one at a time, leaving enough of a gap between yourself and your partners that the gate can recognize each of your individual transceiver signals. LED lights form a red cross which will turn to a green circle as the gate successfully registers the closest transceiver, so always wait for it to turn to the red cross again before you make your approach. Once at the top you’re ready for the best bit! The easiest way down is immediately ahead to the right. 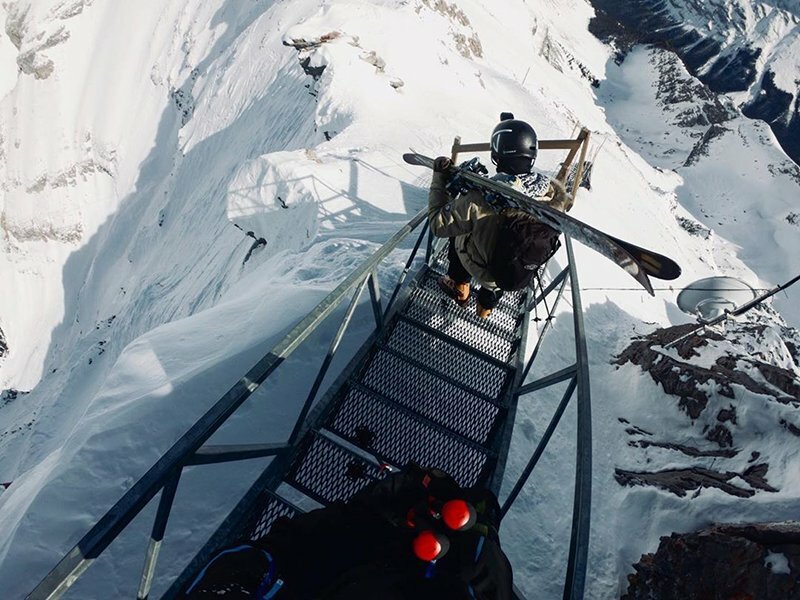 Just head down the metal stairs, find a flat spot to put your skis on, and then follow the narrow slope around the rock band to get to ‘Dive Proper’. This route is the least steep with no cliffs or cornices to navigate at the entrance. Hazards such as cliffs and rocks are located throughout the Dive though, and are never marked, so take your time whilst finding your way. If you don’t know what’s ahead then go slow and spot your route and you’ll be better prepared for your next lap. 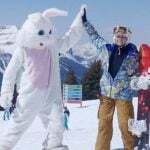 Alternatively, contact the pros at Sunshine Village’s Ski School. Their expert instructors run specific programmes for Delirium Dive where they’ll guide you through whilst giving invaluable tips on how to ski such terrain. Shannon Martin skiis Dive Proper in Delirium Dive at Banff Sunshine Village. Photo by Will Lambert. If you want to up the challenge, you can traverse along the ridgeline to the left instead of taking the stairs, finding the Bre-X entrance at the end of the ridge. This entrance does not have any mandatory cliff drops but is steeper than Dive Proper, and so a fall here is best avoided. From here you can pick your way down the chutes and spines and through the rock bands which make up the upper sections. Soon the gradient will drop off and you can enjoy some more relaxing turns in the lower powder fields. To exit, there are two choices. Most lines funnel towards a gully on the skier’s left which will bring you out to a flat meadow. From there a short hike will connect you to some runs which flow back to Goat’s Eye. The other option is taking the Fatboy Traverse on the far skier’s right of Delirium. This traverse will either take you to an open slope called Fatboy, or to the tree runs of Hayes Hill, both of which empty out onto Eagle Creek for a cruise back to Goat’s Eye. Please note – backcountry etiquette applies in this terrain! You must stick with your partners, descending each section one at a time, whilst waiting and regrouping at visible safe spots off to the sides of the main chutes. 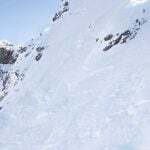 Loose snow and small slab avalanches can occur, as can falls. Stay safe and keep ski patrol happy by giving each other lots of space rather than skiing on top of one another. Now you have the scoop, dive in to one of the world’s most infamous runs and see why the locals are always wondering when the Dive’s going to open! 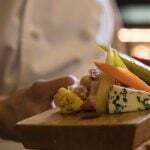 Our friendly Reservations Team is always happy to share their local knowledge and experience to help you find the best vacation package for your style and budget. You can reach them by calling 1-844-754-2443.